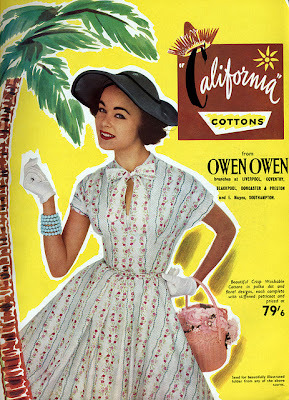 The Secret Dreamworld of a Vintage Girl: California Cottons! How Can Anybody Not Love These? California Cottons! How Can Anybody Not Love These? So, it's my first blog. I'm going to start by talking about my favourite vintage designer from the 1950s and 1960s, California Cottons. These dresses are absolutely beautiful but are incredibly hard to find, especially with the tags still attached as I realised yesterday whilst searching for more on the internet! It seems I might actually own two California Cottons dresses rather than just one, so maybe there might be others lurking around in vintage shops? I personally think this is one of their most modern designs, note the keyhole bodice? Although small, I have a feeling that this might have been a little controversial for the conservative 50s girl making her first steps into womanhood. That is not to say that I am not fond of this particular dress, I actually think the cut of it is very flattering, the pattern is pretty without being frumpy, I've tried on a few dresses in various vintage shops that make some of today's designs look very appealling! Still, we can't look good in everything! I'd love to know what other people think about this lovely brand, feel free to comment. It's great that you've found a California Cottons, can I ask where in Norwich you made the purchase? Regarding the dress I would hand wash with Stergene and I'd love to see the tag! Hope this helps and check out my feature in Petas Vintage Boutique magazine on June 1st. Stay in touch and let me know how you get on. Can you send me a picture, I'm curious to see your new item!